Caleb Isler of North Union holds on to Jacob Romero’s (Pleasant) leg during a quarterfinals match of a Division III regional wrestling duals at Centerburg on Saturday. The Wildcats lost by a 40-39 margin after a tiebreaker and were eliminated from the state duals meet. Two locals teams entered the wrestling state duals this year and neither will be moving on after suffering defeats during a Division III regional meet at Centerburg on Saturday. 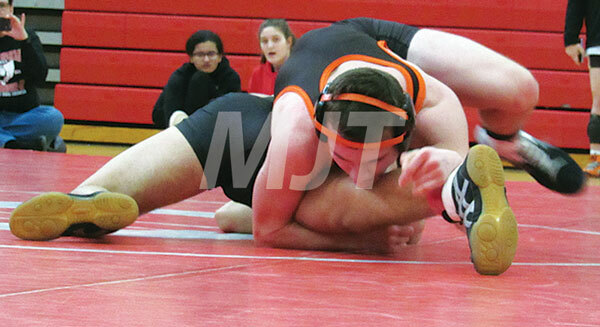 The North Union Wildcats returned to the duals after a year’s of absence from and found solid success in their first match, beating Utica, 45-33. The Wildcats saw early success in their lineup with Tarren Riffle at 113 pinning Brock Wygle of Utica in 1:45. Hayden Pacha at 120 also found a quick pin in 31 seconds to help North Union take an early 12-6 lead. Utica was able to gain some ground in the middle weights with a pin at 126 over Ethan Wagy and a pin over Austin Jamison in 2:50. Caleb Isler helped the Cats rebound at 138 with a 3-1 decision over Roger Moran. North Union forfeits, however at 145 and 152 gave Utica a 30-15 lead. Alec O’Reilly (160) started NU’s climb back to the top with a pin over Briar Harris in 2:29. The Wildcats stumbled at 170 when Skyler Cowgill lost by a 4-3 decision. Chris Cox-Wilson (182) was able to help NU rebound with a pin over Parker Frazee in 3:35. That match whittled North Union’s deficit to 33-27. A trio of Utica forfeits at 195, 220 and 285 gave the Wildcats the lift they needed to win the match. The victory moved North Union to the quarterfinals. The Wildcats found their end to the duals season in a familiar foe Pleasant, losing 40-39 by way of a tiebreaker. NU took an early lead with forfeits by the Spartans at 106 and 113. Pacha upped North Union’s score climbing with a pin over Nic Depuy in 2:11. The Spartans picked up points at 126 and 132 with pins over Jamison and Wagy. Isler gave the Cats three more points at 138 with a 6-3 decision over Jacob Romero. Wyatt Wells and Michael Phelps, though, won by forfeit at 145 and 152 for the Spartans to take a 24-21 lead over NU. Pleasant’s Boston Grant (160) defeated O’Reilly by a 20-3 technical fall and that became the deciding factor of the match. Gavin Baisden was able to pick up four points for the Spartans with a 14-4 major decision over Cowgill at 170 to give Pleasant a 33-21. Cox-Wilson won by pinfall over Conner Sparling in 3:26. At 195, Beltz lost by pin to Brad Lee in 3:10, but Dylan Thompson was able to keep the match tight at 220 with a pin over Nick McCall in 1:22 to pull the Cats within six points. Pleasant didn’t have a 285-pounder, which gave NU’s Zach Millard the win by forfeit. That tied the match at 39-39. After some deliberation, the Spartans were given the winning point for the technical fall at 160 pounds. Fairbanks was also at the match and lost in the first round to Northmor by a score of 48-24. The Panthers had to give up forfeit points in the first four bouts to give Northmor the lead. At 132 pounds, Fairbanks’s Dominick Coy fell to Gavin Ramos by pinfall in 1:05. Aidan Groves picked up FHS’ first points at 138 with a forfeit to put the match at 24-6. Northmor’s Eli Davis of Northmor (152) won by a pin over Ethan Chippas in 2:30. Connor McCardle added to the Panthers’ point total with a 160-pound pin over Gage Myers in 4:30. Tucker Green (170) followed up with a pin over Jordan Haines of Northmor in 1:51. Ashton Griffith at 182 suffered a defeat by pin fall to Northmor’s Conor Becker in 36 seconds. The Panthers closed out the match with a win at 285. Billy Reed-Bodey of FHS pinned Hunter Brookover in 1:52.